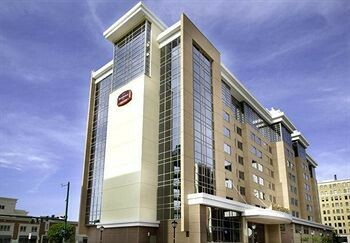 Property Location With a stay at Residence Inn Norfolk Downtown in Norfolk, you&apos;ll be minutes from Hunter House Victorian Museum and Chrysler Museum of Art. This hotel is within close proximity of D&apos;Art Center and Pagoda and Oriental Garden.Rooms Make yourself at home in one of the 160 air-conditioned rooms featuring kitchens with full-sized refrigerators/freezers and stovetops. Complimentary wireless Internet access keeps you connected, and cable programming is available for your entertainment. Conveniences include complimentary newspapers and separate sitting areas, and housekeeping is provided daily.Dining Grab a bite from a snack bar/deli serving guests of Residence Inn Norfolk Downtown. Meet other guests and eat at a complimentary reception.Business, Other Amenities Featured amenities include a business center, complimentary newspapers in the lobby, and dry cleaning/laundry services.